This pin came with set 48153 and was a gift for Castaway Club members. This pin features Mickey and Minnie Mouse laying on a beach assumably Castaway Cay sunbathing with the cruise ship in the background. The pin also has Castaway Club and Disney Cruise line at the top and at the very top features the DCL logo. Aqua lounge and light pink bow and swim suit. This is the Disney Cruise Line (DCL) 2000 logo pin. Mickey is dressed as a captain and holding a ship's wheel for one of the zeros with flotation rings for the other two. The "2" is a yellow rope. Mickey is saluting. "Disney" in red Walt cursive at bottom of the pin, "Cruise Line" to the right in blue on a white background. This is for 1999 cruise line cast members. They have a new one out that has 2000 instead of the red Mickey outline. They were also given out at the convention or one similar to it.. There are several slightly different sizes and colorings of this logo. Rectangular pin sold only on Disney's private island, Castaway Cay from the Disney Cruise Line (DCL). The pin is painted, not cloisonne style. It's very colorful and shows a stylized sun, palm tree and lagoon. Mickey ears are in all four corners. The pin says "Disney's Castaway Cay, Bahamas". From the Disney Cruise Line® - Mini Pin Boxed Set #58977. Cutie (cute character) Mickey Mouse dressed as Captain, wearing a white hat with yellow circle and blue brim, red jacket blue pants and black shoes. This pin features Captain Mickey standing tall on Castway Cay ready to welcome his guests. In the background is a ship. There are palm trees to the left. At the top in red are the words Castaway Cay and at the bottom in orange is 2014. This pin from Castaway Cay (the cruise line's (DCL) private island) shows a setting sun behind a palm tree and comes on a card which reads "Environmentality -- Save our Seas". Under the pin it reads 'Thank you for experiencing the underwater world of Castaway Cay'. Has Jiminy Cricket in color holding his umbrella on the right side of the card. This pin was given out in the first year of the Disney Magic when guests at Castaway Cay completed the snorkling and returned their snorkling equipment. This was a limited release program aboard the Disney Magic and Wonder. This gift with purchase pin is only redeemable via a coupon found in your stateroom. 1 and only 1 coupon per stateroom for each of the 3 different pins. Purchase anything from Mickey's Mates, Treasure Ketch or Radar Trap and present the coupon for that day to receive the FREE pin. On the first night of sailing you can only get the "Captain Mickey", Welcome Aboard Pin. Put all 3 pins in the series together and they form a ship. There is a Limited Release card to hold the pins which is in your stateroom upon arrival along with the 3 different coupons. This is the Captain Mickey Welcome Aboard pin. Series includes 67689, 67690 and 67691. This pin is from Castaway Cay, Disney's private Bahamian Island. It features an orange Mickey shaped sunset over the beach. It has a Palm tree on either side and says: Disney's Castaway Cay Bahamas. It has very vibrant colors and is an attractive looking pin. It is only available on Castaway Cay and also on the Magic and Wonder Disney Cruise Line (DCL) ships. The text "Disney's" and "Bahamas" is painted on and can be easily removed. This is one of a set of 5 pins given to guests on the Disney Cruise Line on New Year's Eve 1999 (and in subsequent years, apparently). The red, white and blue pin shows the Disney Cruise Line wave logo with a red "2000" over the wave. The pin is like (#1275), except larger and with a double post back. The pin measures 2 1/8" (53 mm) wide by 1" (24 mm) tall. Pin is a portrait of the cruise line "captain". He's posing in his captain's uniform against a blue background. The picture is in a gold and white frame. The picture for the pin is taken from the trading card given out onboard. It is a stylized picture of Captain Tom from the Disney Wonder. Disney Cruise Line. Only available on the ships. The Old Man of the Sea - Grumpy? Did we know that he liked to be on the sea? He is leaning on a yellow anchor with his usual expression. Grumpy and his leaning anchoe are pin-on pin. On the pin are the words Salty & Bitter (really?) and Strong & Stout. Along with The Old Man of the Sea. Pin created exclusively for 100 Years of Magic and sold exclusively on board the Disney Cruise Line. This pin is also a spinner. It is approx 2.5" round, point to point. This is the Disney Cruise Line Mosaic Ship Logo Pin. Sun, clouds in background; water/waves/ocean in foreground. It is only available for purchase on the Disney Magic and Disney Wonder. This pin is avilable only on Castaway Cay. It's a two-level pin. The bottom shows grass and bushes, and at the top it reads "Disney's Castaway Cay". The top level is is a gray prop plane like the ones found on the island. This open stock rack pin released through Disney Cruise Line (DCL) features the Castaway Cay island with the ship which slides back and forth is in the background. The bottom of the pin reads Disney Cruise Line. This dangle pin was available to passengers on the first 7 day cruise on the Disney Magic hosted by the Disney Cruise Line. It is LE 4000. The pin is 3.5" x 4.5". Several hundred of them were available at the 2000 Disneyana convention. As of June 2001 they were still available on the ships for half price. The pin features The Magic, facing left, with a banner underneath it. On the tan banner is written "Disney Magic", "First Seven-Night Caribbean Cruise", "August 12, 2000". The dangle is a series of "boards" with "Port Canaveral, St. Maarten, St. Thomas, and Castaway Cay" written on them in yellow. Front of pin says "Northern European Capitals Cruise 2010" "Disney Cruise Line". Back of pin says "Limited Release" Disney Cruise Line, Disney China, Pin trading logo 2010. Size 2"H x 1"W Card is navy blue with Disney Cruise Line and Limited Release on front. Pin was released on first day of the cruise. DCL - Star Wars Day At Sea - 2017 - Voyage Through The Galaxy, commemorating Star Wars Day At Sea, This pin features 2 light sabers and logos of both the Rebel Alliance and the Imperial Empire, and images of Millennium Falcon, X-Wing Fighter, Star Destroyer, and Tie Fighter. The bottom of the pin has "Star Wars Day At Sea Disney Cruise Line 2017". Back of the Pin: FAC-046730-16288, STAR WARS Day At Sea Disney Cruise Line 2017, 2017 Official Pin Trading Logo, Limited Edition 2500 ©Disney © & ™ Lucas film Ltd. Made in China, DCL Wave Logo Disney Cruise Line. 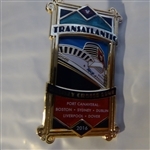 This pin commemorates the Disney Magic 2016 Transatlantic cruise itinerary. The rectangular pin has a gold frame. Inside a recessed window there is a view of the front portion of the Magic cruise ship. Above the opening is the word Transatlantic and below it are the words Disney Cruise Line. Below that is a red banner listing the ports of call : Port Canaveral, Boston, Sydney, Dublin, Liverpool, Dover, there is a diamond at the very top with the DCL wave logo and a diamond at the very bottom with the year 2016. Backstamp is ODPT to the left, Copyright Disney, Made in China, DCL logo to the right all above Limited Edition of 1000. FAC is screenprinted below the bottom post. This pin shows Mickey in red and blue swim trunks and Minnie in a yellow bathing suit with a matching yellow bow watching an unnamed Disney Cruise Ship sailing past a setting sun with red and orange clouds. The Castaway Cay logo picks up the yellow color of the setting sun and gentle waves. Red and yellow flowers also adorn the Castaway Cay logo. Just under Castaway is the wave and Mickey icon (in red) of DCL. DCL - Star Wars Day At Sea - 2017 - Porthole Character Pin - Stormtrooper - Gold Porthole with Blue Glass hinged pin that opens to feature Stormtrooper. Sold individually (LE 2500) and as part of a limited edition boxed set that includes a hinged completer pin (LE 500). Back of the Pin: 2017 Official Pin Trading Logo STAR WARS Day At Sea Disney Cruise Line 2017, DCL Wave Logo Disney Cruise Line, Limited Release ©Disney © & ™ Lucas film Ltd. Made in China, FAC-046730-16288.